6. How to go to Iran? Video : What is Taarof ? The Taarof may drive you crazy… But so sweet at the same time! It is complicated BUT on the upside you’ll be a millionaire! First things first, you can’t withdrawal cash nor can you pay with your credit card in Iran – You will have to bring enough cash to cover the entire cost of your trip. The currency is the Iranian Rial, but Iranians talk in Toman: 1 Toman = 10 Rials. It can sometimes be a bit confusing! Iranian Rial currency rate isn’t stable at all… The best website so far to track from abroad its rate is Rial Converter. Tehran is the most expensive city in Iran. Prices for such products are similar in big ski resorts and slightly cheaper everywhere else. The official language is Farsi also known as Persian. The Perso-Arabic alphabet is written and read right to left. The latin alphabet is sometimes used on the web, social networks or to write SMS. In cities, most young people speak English. Expect to engage conversation in parks, metro, bus and other public areas as soon as you have been spotted as a tourist. In rural areas, English speakers are more rare. For direction: the big majority of signs are translated into English. No problem to get connected! Don’t expect a 40mb connection… but enough to check websites and watch videos. Iranians are technology fans and love sharing tons of photos / videos on Instagram (these are authorized and it is the most widely used social network in Iran). When travelling for more than a couple of days, buying a SIM card can be wise. IranCell, one of the main operators, provides good network coverage and cheap 3G/4G charges: About 200,000 Rials for 5gb of Internet! For charging your mobile and laptop, no worries : 220V and same plugs as in Europe (Except UK). Censorship: The governement censors some websites and most social networks. If you want to use FB or Youtube, best to install a VPN such as: Hotspot Shield or XVPN. A VISA is mandatory to enter Iran. At the airport, a 30 days pass “on arrival” will cost 75€ (Sept. 2017). Entering the country through a border requires you to get the VISA in advance – See this page. More and more direct flights are connecting Teheran to Paris, Bruxelles or Frankfurt. Another option is to make a stop in Istanbul – you can then easily reach all major Iranian cities with direct flights: Tehran, Shiraz, Isfahan, Tabriz or Mashhad. From Europe, you can find cheap round-trip flights for less than 300€ – depends on your booking date. If you plan to bring your ski gear, be sure to check the extra baggage charges. For those with time and motivation, you can travel to Iran by bus, car, bike or even hitchhiking – Take a look at this post if you want to go by bus. The transportation infrastructure is well developed in Iran. Regular bus, train and plane services connect the main cities. A 600km trip at night from Tehran to Tabriz with a VIP bus (comfy seats) will cost about 9€ to 13€. Regular / super-cheap shuttles or “minibuses” also connect the main cities to villages. The easiest and fastest way to reach ski resorts is with your own car. Taxis are also easy to find and relatively cheap for westerners. 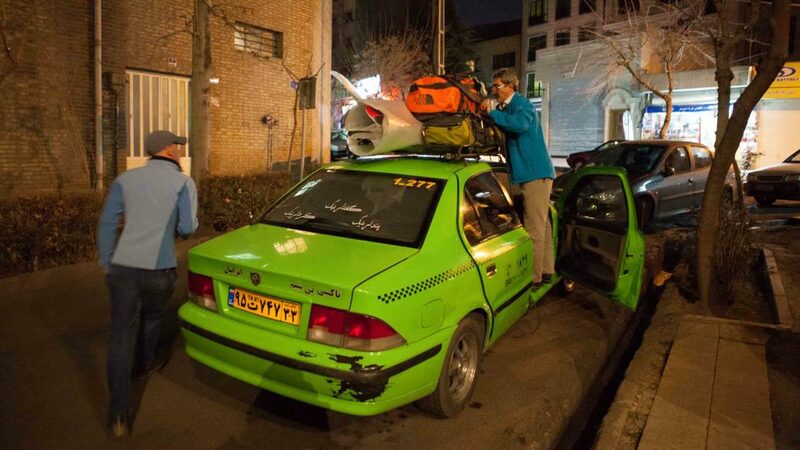 You’d like to keep your freedom of movement and experience the Iranian driving style? Then you might like to rent a car.